Cast: Ismael Merlo, Alfredo Mayo, José María Prada, Emilio Gutiérrez Caba, Fernando Sánchez Polack, Violeta García. Synopsis: Old 'friends' José (Merlo), Paco (Mayo), and Luis (Prada) reunite after eight years for a day's hunting on José's country estate, with Paco's brother-in-law Enrique (Gutiérrez Caba) also enthusiastically tagging along. But as the day wears on, old tensions and fractures in their relationships become apparent and violence bubbles to the surface. Shot in crisp black and white (cinematography by Luis Cuadrado) and sharply edited by Pablo G del Amo (in the documentary about the latter, written about on here last year, the editor tells Saura that this is the only film that he revisits on a yearly basis), La caza marks Carlos Saura's first collaboration with producer Elías Querejeta (who had a preferred team of technical crew) and a stylistic leap on from Llanto por un bandido. 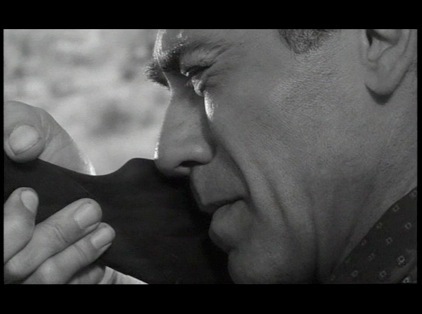 The film is considered a landmark in Spanish cinema - 'together with Nueve cartas a Berta (Nine Letters to Berta, Basilio Martín Patino, 1966), [...] La caza is the most representative film of the mid-1960s cycle that came to be known as Nuevo cine español [New Spanish Cinema]' (Mira 2010: 71) - and won Saura the Silver Bear at the Berlin Film Festival in 1966 - his first international award. As an outsider to this clique, and crucially of a younger generation, Enrique is at one remove from the associations generated by the older men. He therefore acts as witness, and audience proxy, when bitter resentments and disappointments finally cause psychic breakdown and the men turn on each other with spectacular violence. The film ends with a freeze frame of his face, his panting still audible on the soundtrack, as he runs from the scene in horror. 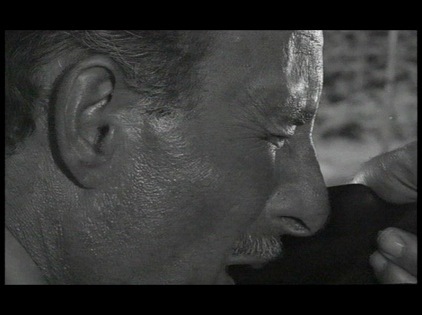 State of mind, or at least the animosity under the surface, is also signalled early on via the editing in the sequence where the men are preparing their weapons: a series of shot-reverse-shots show Paco in extreme close-up checking his sites facing right, then cuts to an extreme close-up of José doing the same but facing left (making it appear that they could be aiming at each other), the sequence of shots then repeats before a mid-distance shot establishes their actual positions in relation to each other (sitting alongside one another facing in opposite directions). Hopefully I will return to this film later in the year as I've barely scratched the surface in this short piece and many different angles could be taken -it is an incredibly rich text and a small mountain of material has been written on it (I've only read a fraction of it so far -I've found a book, La caza...42 años después [La caza...42 years later], which is a collection of articles about the film and looks really interesting but as it's in Spanish it'll take me a while to read). My intention with the future longer pieces is to draw groups of the films together, but obviously I can't start to think about that until I've watched more of them. Cueto, R. (ed.) 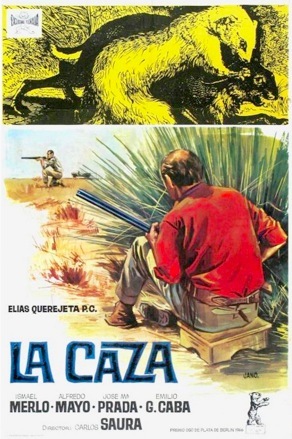 (2008) - La caza...42 años después, Valencia: Ediciones de la Filmoteca. D'Lugo, M. (1991) - The Films of Carlos Saura: The Practice of Seeing, Princeton: Princeton University Press. Mira, A. 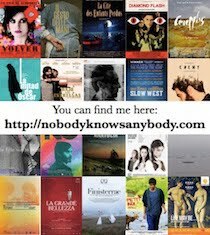 (2010) - The A to Z of Spanish Cinema, Plymouth: The Scarecrow Press. Sánchez-Biosca, V. (2011) - 'La caza', in Directory of World Cinema: Spain, edited by Lorenzo J. Torres Hortelano, Bristol: Intellect, pp.115-117.